The mystery became even murkier this week when Zdeněk Pešat, a literary historian and former member of the Communist Party, told the Czech news agency CTK that Mr. Dlask had told him years before that he had reported Mr. Dvořáček to the secret police, most likely because he wanted to prevent his girlfriend from being punished. As is noted in both the Times article and the original report in Respekt by Adam Hradilek that revealed the existence of the police memo, Miroslav Dlask is not a new character in the drama. He was a close friend of Kundera’s at the time that Dvořáček was betrayed, when the two were in film school together. I related the somewhat byzantine story in an earlier post, but here’s a recapitulation: While on an undercover mission in Prague in 1950, Dvořáček by chance ran into a childhood friend named Iva Militká, whose ex-boyfriend Miroslav Juppa was working undercover with Dvořáček. Dvořáček asked Militká to hold onto a suitcase and promised to come by her dorm and pick it up later that day. Naively, Militká told her then-boyfriend Dlask about the mysterious visitor and asked him to stay away that evening, explaining that Dvořáček would probably want to spend the night. Someone seems to have passed the information along to the authorities. When Dvořáček showed up to claim his suitcase, the police were waiting for him. Today at 4pm, there arrived at this police station the student Milan K u n d e r a , born 1 April 1929 in Brno, residing in Prague district 8 in the student dormitory on King Jiří VI St., and he gave the information that in this dormitory there lives a student Iva M i l i t k á , who communicated to the student Dlask, of the same dormitory, that on this day she met in the Klárov neighborhood of Prague with a certain acquaintance Miroslav Dvořáček. The latter, it is said, gave her the custody of 1 briefcase, saying that he would come for it in the course of the afternoon of 14 March 1950. On the basis of this declaration, constable Rosický together with constable Hanton went to the place in question, where they conducted an inspection of the briefcase . . . Fans and friends of Kundera have naturally wished to find a way to explain the memo away. In the Czech press, almost no one has tried to argue that the memo is a forgery. 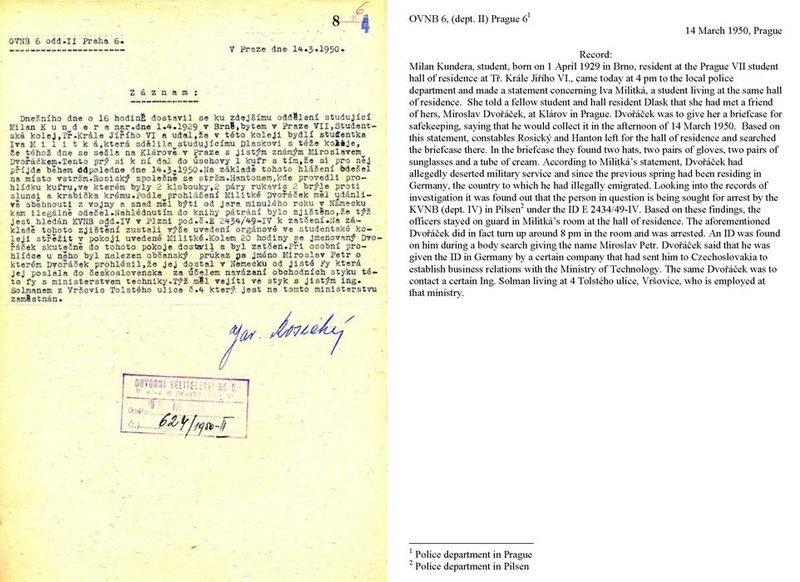 As Petr Třešňák writes, “To forge a half-century-old police typescript with the appropriate diction, stamps, and knowledge of the context of the case is a feat few could pull off.” Zdeněk Pešat’s new testimony opens another possibility: Maybe it was Dlask who informed on Dvořáček, and Kundera’s name appears on the police memo in error. Or maybe Dlask informed on Dvořáček while impersonating Kundera. When I read in Tuesday’s Lidové noviny about the developments in the “informer” scandal surrounding Milan Kundera and saw the name Miroslav Dlask and a photograph of Iva Militká, an incident from the spring of 1950 came to mind. At that time I was in the third year of the Philosophical Faculty of Charles University in Prague and a member of the school’s Communist Party council. Miroslav Dlask turned to me with the communication that his girlfriend (and future wife) Iva had met with a former comrade, whom she knew to have fled to the West and to have returned apparently illegally. Dlask told me that he had notified security. He felt that he had to inform his local party organization about it. And because we had studied aesthetics together and since he knew me better than any other member of the school Communist Party council, he told me. I assumed that Dlask wanted to protect his girlfriend from the possibility, which could have become a reality, that it was disclosed that she had had contact with an emigrant or even perhaps an agent provocateur from State Security forces. To this communication I in no way reacted, and I spoke of it with no one. I did not meet with Dlask after college and I put it out of my mind. I am a seriously and incurably ill person, in essence a bedridden patient dependent on a respirator. For this reason I am incapable of meeting with anyone and must refuse any interview. Yesterday, after reading the newspaper, I told my wife about the incident with Dlask. We agreed that I would write out everything I knew about these things, and that’s what I have done. Asked about Pešat’s statement, the editors of Respekt insist that they stand by their story. Of course, it’s possible that Kundera told the local police department about Dvořáček, and that Dlask told their school’s party official about him. It’s easy to reconcile Pešat’s memory with the police memo by imagining that Dlask told Pešat something along the lines of “We took care of this,” meaning that he and Kundera did, and that Pešat either didn’t hear Kundera’s name or forgot about it later. And Pešat’s statement doesn’t help at all in explaining how Kundera’s name showed up in police records. Indeed, when asked to explain it by the Czech news service CTK the next day (in an interview conducted despite his illness), Pešat merely said that he had received a phone call from Kundera that morning and that Kundera was fighting the allegation and rejected it. Hradilek and others have raised the possibility that Dlask was jealous of Dvořáček, and turned him in (or arranged to have him turned in) to remove a romantic rival. This possibility, too, fails to exonerate Kundera, unless one also supposes that Dlask impersonated Kundera at the police station. But if Dlask wanted his nose clean so badly that he was willing to impersonate Kundera to the police, then why did he tell Pešat in person? And if Dlask wanted his nose clean, isn’t the likelier explanation that he asked his friend Kundera to take the story to the police for him? Another line of exoneration is the hypothesis that Kundera did turn Dvořáček in, but that he thought Dvořáček was merely a “suspicious person,” and had no idea he might be an undercover agent. “Kundera as the foreman of his dormitory was responsible,” writes Lidové noviny, explaining a theory put forward by Jiří Pernes of the Institute for Contemporary History. “If Dlask informed him of a foreigner in the dormitory, then he notified the police. At that time, it probably didn’t even occur to him that because of this, Dvořáček could receive years in prison. It was for him an episode, and so it’s possible he doesn’t even remember it.” It’s an ingenious explanation but not in my opinion a persuasive one. In the police memo, Kundera, or an informer going by his name, relays Militká’s statement that Dvořáček “had allegedly run off from the army and perhaps had been living in Germany, where he had immigrated illegally.” Whoever turned Dvořáček in knew that Dvořáček was going to be in big trouble. A number of Czech commenters have complained that Hradilek oughtn’t to have published his article until he found corroborating documents. But what if there’s only one document, and it’s this one? 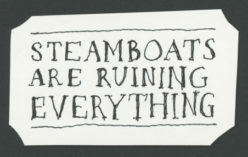 It may be that this is all the evidence historians will get. Hi, Andrew. I do, yes, though I'm a bit out of practice. I used to translate, back in the day.